"Better web and Better for the environment"
"Google prides itself on its green operations and puts great effort into cutting down energy use as much as possible and using renewable energy for the power it does need." Google spent €200 million ($273 million) for its new data center and two years converting an old paper mill factory into a state-of-the-art data center. And it was well worth it, the company will save a lot of money on energy bills thanks to the use of seawater for the cooling and the colder climate in the area. Google chose the site of an old paper mill that shut down in 2008 due to lack of demand. The mill already had a huge seawater cooling system built, to keep the machinery cold. Now, Google has converted the cooling system to keep its thousands of servers from overheating. Google used a water-to-water exchange in the data center and relies on the low ambient temperature to do most of the cooling. 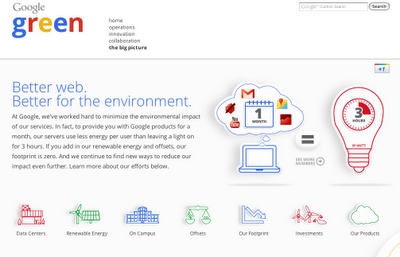 Google've worked hard to reduce the amount of energy our services use. In fact, to provide you with Google products for a month—not just search, but Google+, Gmail, YouTube and everything else they have to offer—our servers use less energy per user than a light left on for three hours. They’ve learned a lot in the process of reducing our environmental impact, so they’ve added a new section called “The Big Picture” to our Google Green site with numbers on our annual energy use and carbon footprint. Whenever possible, They use renewable energy. We have a large solar panel installation at our Mountain View campus, and we’ve purchased the output of two wind farms to power our data centers. 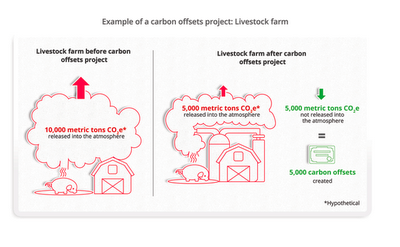 For the greenhouse gas emissions they can’t eliminate, they purchase high-quality carbon offsets. By investing hundreds of millions of dollars in renewable energy projects and companies, we’re helping to create 1.7 GW of renewable power. That’s the same amount of energy used to power over 350,000 homes, and far more than what their operations consume(Says Google). Finally, Their products can help people reduce their own carbon footprints. The study (PDF) we released yesterday on Gmail is just one example of how cloud-based services can be much more energy efficient than locally hosted services helping businesses cut their electricity bills. Visit Google Green site to find out more. I surprise how so much effort you set to make this sort of wonderful informative website.